In the past couple of posts, I've talked about the need for backyard planning in our #newoldbackyard including the placement of a potential pizza oven and pavilion and my desire (despite Nat's properly-grounded resistance) to incorporate a waterfall/water feature into the 'entrance' of the backyard along with some stone stairs. Because we've been so deliberate about all the choices that went into our New Old Farmhouse, I thought it was only appropriate that we enlisted some professionals when thinking about phase 2 of our landscape design and specifically to help us figure out the best way to provide some privacy screening and transition from the front yard to the backyard - as this will be the main traffic route for us and guests. If you look back at this post that shows the pizza oven placement options, you can see the existing patio that we are working with and if you peek back at this post that shows a photo of this so-called 'entrance' to the backyard that I'm trying to solve. The first draft of one way to solve these problems together you can see below. We worked with a firm who came out and looked at what we're working with in terms of grade, fence and the privacy situation we're attempting to solve. The overhead view shows the planting on some larger trees - likely European Hornbeams - along the fenceline on the right side of the lot. And then some elevated beds/walkways that provide a level grade to navigate backwards while retaining some of the swale/drainage setup that is existing in the current plan. 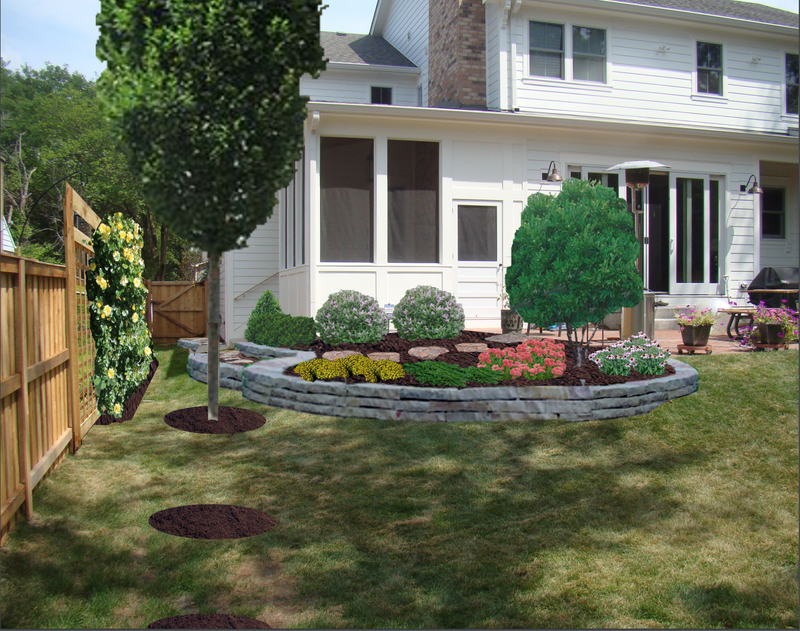 And here's a rendering of what this design entails: You can see one of the trees in place and the location of the two others in a row, plus the rounded nature of the elevated, hardscaped beds, a series of new plantings both along the foundation and in the newly created beds and what appears to be a trellis structure with a climbing flowering plant that rises what appears to be 3 feet above the fenceline to provide some of the screening that we want in the screened porch. While there are some aspects of this that I like (like the planting that changes the sightlines from the family room looking north and the foundation plantings), there are a few pieces of feedback that I shared including: can we incorporate something like that waterfall feature in here, it seems that we need more/higher screening adjacent to the screened porch (more than the trellis would provide). 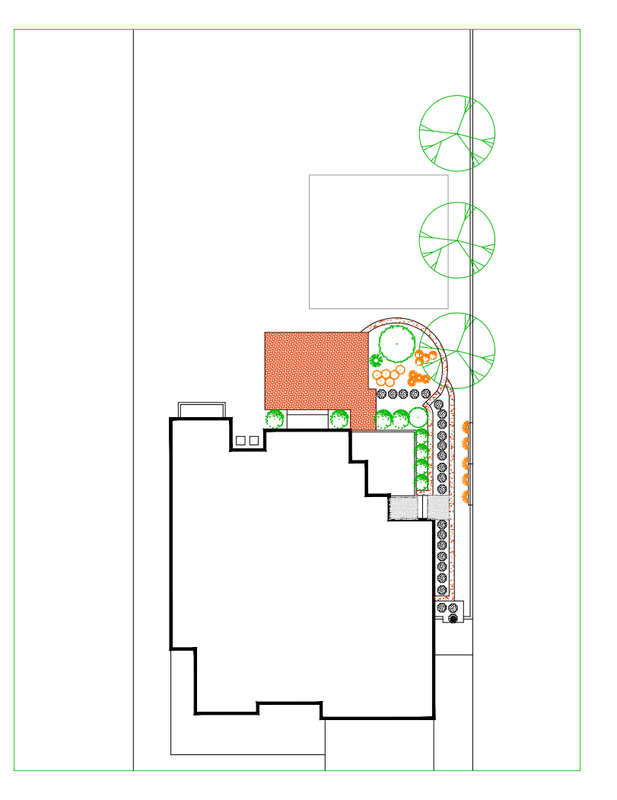 I'm not sure if there is enough room to have both a walkway and trees, but I really want to find out and have a landscape designer flat out tell us no on that.